Effective physical education changes lives for the better. As a leader in the physical education community, US Games knows that it’s our responsibility to provide teachers with the tools and services they need to help students develop healthy and active lifestyles. We are committed to providing great products and excellent customer service. 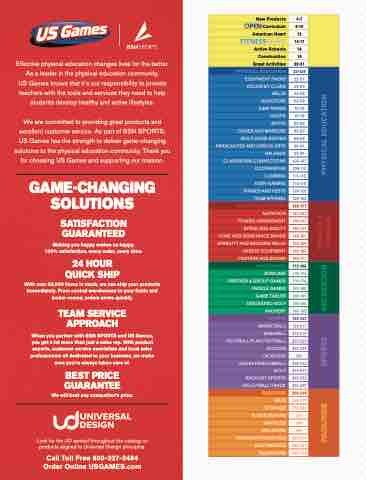 As part of BSN SPORTS, US Games has the strength to deliver game-changing solutions to the physical education community. Thank you for choosing US Games and supporting our mission. Making you happy makes us happy. 100% satisfaction, every order, every time. With over 25,000 items in stock, we can ship your products immediately. From central warehouses to your fields and locker rooms, orders arrive quickly. When you partner with BSN SPORTS and US Games, you get a lot more than just a sales rep. With product experts, customer service specialists and local sales professionals all dedicated to your business, we make sure you’re always taken care of. Look for the UD symbol throughout the catalog on products aligned to Universal Design principles.